The QLT by MARSHALLTOWN Deluxe Grout Cleaning Kit contains all of the equipment needed for cleaning the grout off of recently installed floor tile. The kit includes a 6-gallon wash bucket, 2 sponge floats and 4 replacement float pads. Grout System The QLT by MARSHALLTOWN Deluxe Grout Cleaning Kit contains all of the equipment needed for cleaning the grout off of recently installed floor tile. 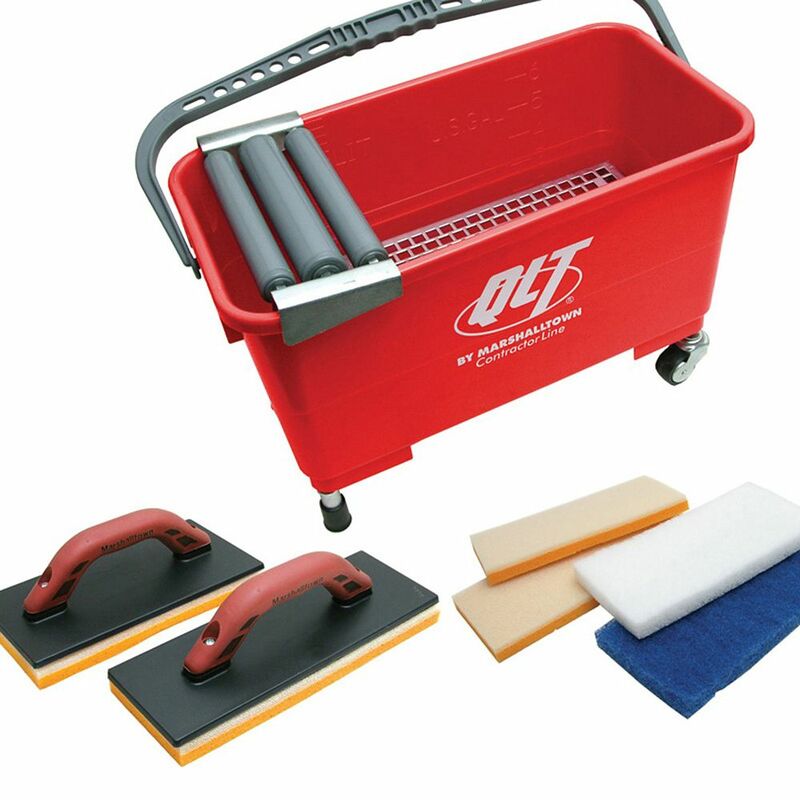 The kit includes a 6-gallon wash bucket, 2 sponge floats and 4 replacement float pads. Grout System is rated 4.5 out of 5 by 8. Rated 5 out of 5 by Mtnbrndog from Great product it has made cleaning the tile so much easier and 3 times as fast. Great product it has made cleaning the tile so much easier and 3 times as fast. Rated 5 out of 5 by Tim from A lot easier and faster than the plain sponge method.... A lot easier and faster than the plain sponge method. If you have a big area or plan to lay tile more than once, this is well worth it. Rated 2 out of 5 by bll from not so much the product works nicely with the exception that the pads or sponges will not stay attached to the handle, a disappointment considering the respected name brand. Rated 5 out of 5 by BaysideBuilders from Buy this if you value your time!!! Unbelievable how much time this saves. I will never use the sponge and bucket method again. Wish I would have purchased this years ago. Rated 4 out of 5 by Zach1669 from It's a good product for big area. The Quality of the product is great,and would buy another one if I needed. Rated 5 out of 5 by DonJ from GROUT SYSTEM GREAT VALUE. SAVE SO MUCH TIME. WORKS GREAT WISH I HAD BOUGHT A LONG TIME AGO !!! Rated 5 out of 5 by DonJ from DELUXE GROUT SYSTEM GREAT PRODUCT. MADE MY GROUTING JOB MUCH EASIER. WHAT A TIME SAVER. IT MADE IT SO MUCH EASIER THAT MY WIFE EVEN HELPED AND SAID IT WAS SO MUCH EASIER THAT WITHOUT THIS SYSTEM.